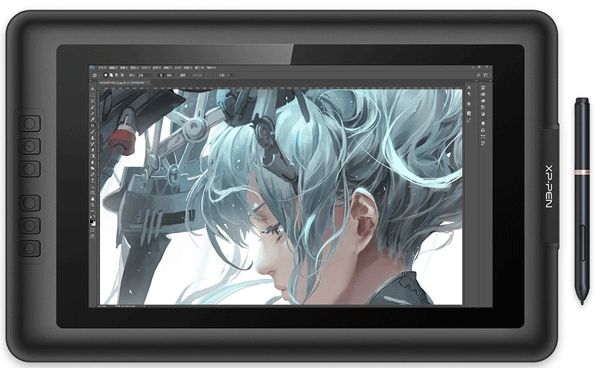 XP-Pen Artist13.3 is one of the most affordable Cintiq alternatives out there, price-wise. It’s really a good choice if you’re cash-strapped, as long as you don’t mind drawing on a smaller screen, as adding a bit more money can get you few inches of screen space (up to 19-inch, if you’re willing to pay for it). While XP-Pen Artist13.3 supports less pressure sensitivity levels, or 2048 levels to be precise. I don’t think this is a reason not to get it. As that’s more pressure than you need. It’s really nice how XP-Pen Artist13.3 can draw power from USB port, this feature, along with its smaller size makes it a bit more portable, to the degree you could carry it with a laptop to draw on the go. In case you decided to plug XP-Pen Artist13.3 to the wall, you get support to all sorts of plugs with this tablet, like US, UK & AU plugs. Having 6 hot keys in a cheap drawing pen displays like this is really nice too. 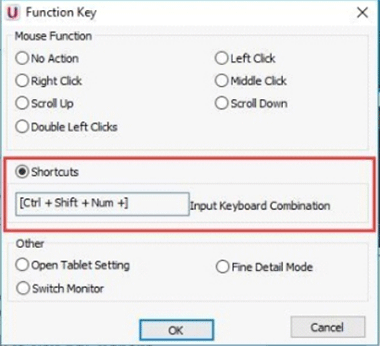 It can help you replace the keyboard in case you don’t need that much keyboard shortcuts. As long as you’re willing to deal with the parallax you may have with this pen display, it’s really worth trying (I explained what parallax means below in the review). Generally speaking, bear in mind that when trying Wacom Cintiq alternatives, and even Wacom Cintiq itself, can be hit or miss, so you may encounter some problems while installing XP-Pen Artist13.3’s driver (I am assuming there’s no hardware faults in your pen display, in which case you better return it). A very affordable pen display, one of the most affordable ones out there. 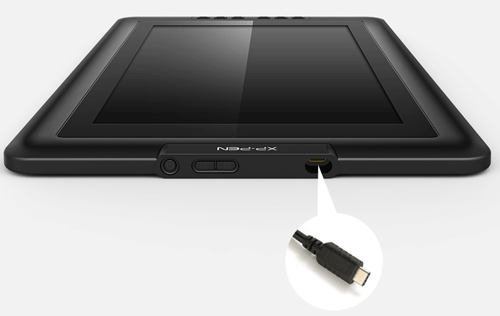 The fact XP-Pen Artist13.3 could draw power from USB port means you could use it on the go with a laptop more easily than other pen displays. Relatively portable due to its small size & thin design. The pen is passive & requires no charging at all. Has a good number of hot keys, something some pen displays don’t have. The driver comes in a USB drive, which is very neat. Getting a replacement pen is affordable, so getting a replacement in case you lost or broke it is not an issue. Nibs are sold in packs of 100, which is so affordable. Doesn’t come with a stand out of the box. Parallax may be the thing you really dislike the most about this pen display. The screen is covered with anti-reflective coating that reduces glare, making it more suitable to drawing outdoor, as well as indoor. Comes with a 3 in 1 cable. Can be used with both right-handed & left-handed people. 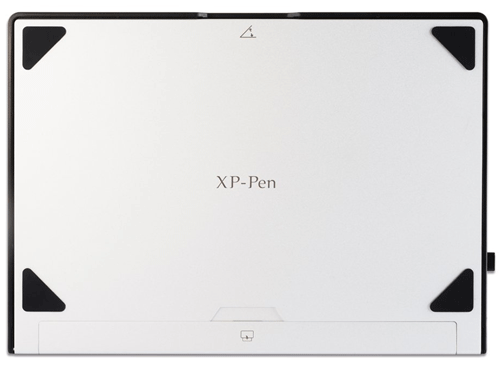 XP-Pen Artist13.3 comes with a 13.3-inch screen, which provides you with a decent drawing area (the active drawing area is 293.76 X 165.24 mm). Some artist will think this is small draw area, but you could get used to it if this is your first pen display, or if you want a portable one to take with you on the go. The screen resolution is 1920 X 1080 (HD resolution), which is good for drawing. Some may prefer 2K or 4K resolution for drawing. The thing is, none of Cintiq alternatives I know to date support that resolution. The IPS panel of the screen means higher viewing angles (and so colors won’t change much when you view the screen from a different angle). It connects to mini-display port, but it comes with an adapter for that(they call it “HDMI to Mac Adapter Cable”), so people with a computers that support HDMI port won’t have to worry about buying an adapters. I will talk more about this shortly when I discuss the 3-in-1 cable. The color gamut of this pen display is 75% Adobe RGB, which is okay to use for art-related tasks. 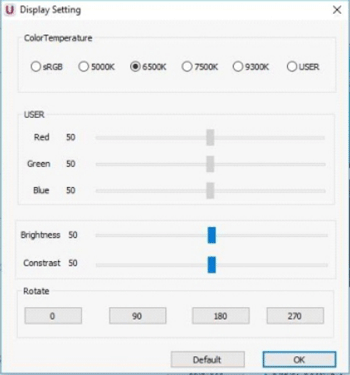 If you use XP-Pen Artist13.3 with another monitor, you may notice some color differences, that’s where calibrating screens comes in handy. You can always use your main screen to see if your colors are alright. XP-Pen Artist13.3 supports 2048 levels of pressure sensitivity, the norm in graphics tablets & pen display these days is 8192 levels, but that’s totally fine, even for a pen display released in 2017. As pressure sensitivity is not what you should focus on to produce good art. It’s the other aspects of the device like the drawing surface, drawing area, driver issues, response rate & other things. I discussed the topic of why pressure sensitivity is not important in my book Getting started with Wacom graphics tablet and Digital Painting With Photoshop: Learn Digital Art & Paintings On Good Fundamentals. The lower pressure sensitivity could be one of many reasons XP-Pen Artist13.3 is more affordable, even compared to other Cintiq alternatives. This is just a speculation, but if that’s the case, they’re lowering the price by removing a feature artists don’t really need. 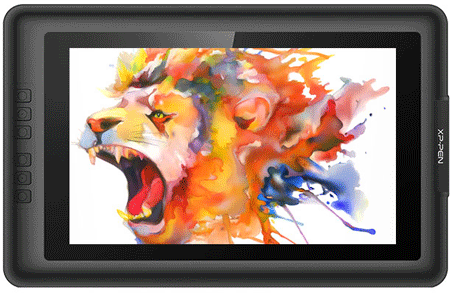 While the screen itself will respond to your pen & allows you to draw with it, this is not a touch screen by any mean. 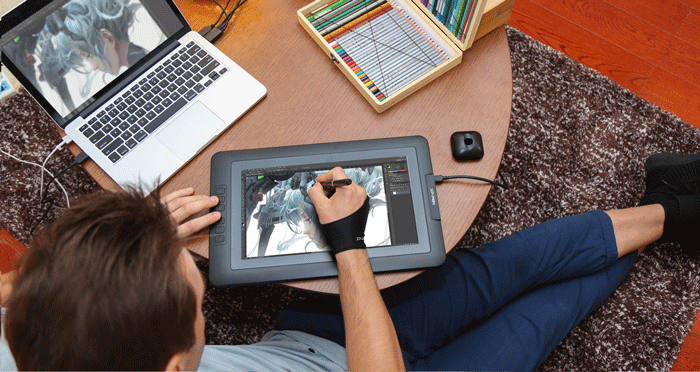 Even though the screen is not really a touch one, XP-Pen Artist13.3 comes with a glove, which covers the lower fingers only, this is to prevent your hand from leaving spots on the screen, as well as makes it easier to move your hands smoothly. One of the worst things about XP-Pen Artist13.3 is parallax. Parallax is where the mouse cursor where you draw is not where you place the pen tip to draw. 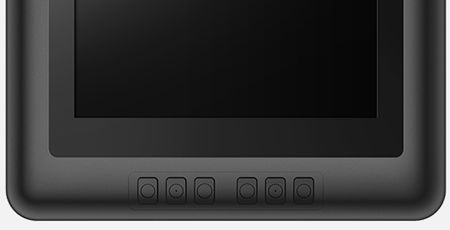 The more parallax in the pen display, the worst it is. You can see parallax in action in the following video, which shows you drawing with Cintiq 27QHD. Notice how the pen & the cursor don’t align well. Calibrating the screen (a feature in the driver where you simply point the screen at specific points) can keep parallax lower, but even then, you will still encounter some parallax for the most part. However, calibrating off the screen points can make things way better, this is a trick that dates back to Cintiq 13HD days, if not before. You will likely have to calibrate it few times before you get it right, but it’s worth the attempt. If parallax. You get used to parallax after some time, especially when you start to look at the cursor while you draw, and not the pen tip itself. It may still feel less intuitive to draw with a pen display like that, especially when parallax is too much, but it’s still faster to draw that way compared to a graphics tablet. Unless there’s a specific problem I am unaware of, I expected XP-Pen Artist13.3 to work with all common drawing software out there, like Photoshop, Paint Tool Sai, and others. I say that because it’s too common for artists to ask whether XP-Pen Artist13.3 works for the drawing application they use. As far as I know, there’s no drawing software that won’t work with XP-Pen Artist13.3, assuming everything else is working. On XP-Pen Artist13.3’s screen there’s a screen protector that adds texture to the screen. The purpose for this texture is to add friction while you draw, and to hopefully make it similar to drawing on paper. You may not like drawing that way, so removing the protector is one option you have there. Some artists really don’t like having friction while they draw digitally, while some really want it. Friction makes it easier to draw lines, especially if you’re new to digital art, but you may not need it while painting & shading. The good thing about the protector is that it makes the screen matte, so it won’t reflect much light & turn into a mirror, which can be quite annoying while drawing outdoor. Mini Displayport, so you connect it the display part of your computer. If you don’t have a mini Displayport in your computer, XP-Pen Artist13.3 comes with a HDMI-to-mini-Displayport adapter. It’s worth noting that the regular Displayport can be converted to mini-Displayport with a cheap adapter. So XP-Pen Artist13.3 can connect to most, if not all modern computers nowadays. USB plug to connect XP-Pen Artist13.3 to your computer. You don’t really to have USB-C on your computer to use XP-Pen Artist13.3. If your computer only has USB-C ports, you will need to get a USB-to-USB-C adapter. The fact that XP-Pen Artist13.3 can take its power from USB means that you could carry it around with your laptop, and not need any power outlet for that (or just one in case you want to work for a long period). Add to that the size, as well as the thin body of XP-Pen Artist13.3, you can have a small mobile studio to carry around (Pun not intended). The only caveat here is that I am not sure if all laptops can provide enough power to XP-Pen Artist13.3. Since USB ports can vary by the mA they can provide. 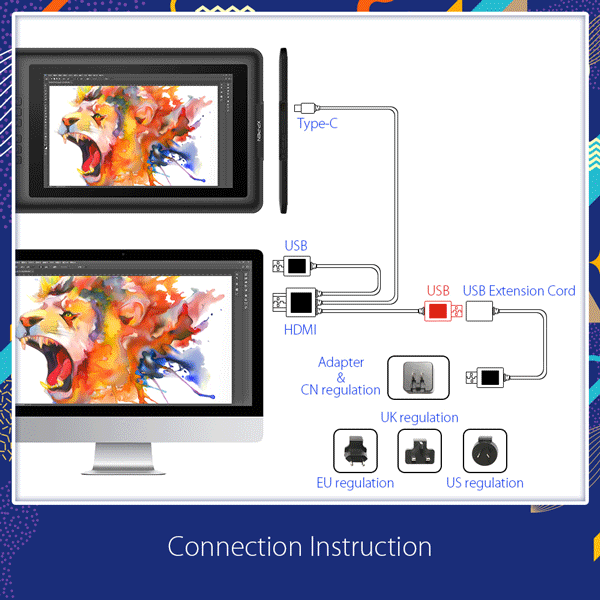 Speaking of power plugs, XP-Pen Artist13.3 supports multiple plug standards like US, UK & AU. 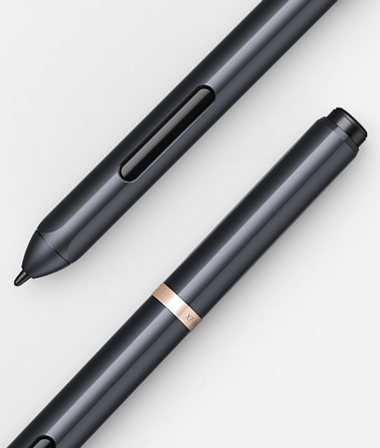 XP-Pen Artist13.3 comes with a passive pen, meaning the pen won’t have a battery inside of it. Almost all the other non-Wacom pen displays I reviewed requires you to charge the pen by plugging a cable into the back of the pen. While the battery of these pens last for a long time, it’s nice not to have to charge the pen at all. The battery-free pen is one of the reasons I discussed why Wacom tablet & other products are more expensive than any of its competitors. It’s worth noting that XP-Pen sell their nibs in packs of 100, which makes it less of an issue to replace them if needed. The pen holder doubles as nibs remover tool, something Wacom introduced starting Intuos Pro 2017 (reviewed here). You just need to insert the nib into the hole in the pen holder, then tilt the pen to remove the nib. While writing this review, I checked the price of the pen, and it was quite cheap compared to Wacom pens. So getting a replacement in case it broke or you lost it won’t be an issue (to be fair, Huion pens are also cheap). XP-Pen Artist13.3 comes with 6 hot keys. 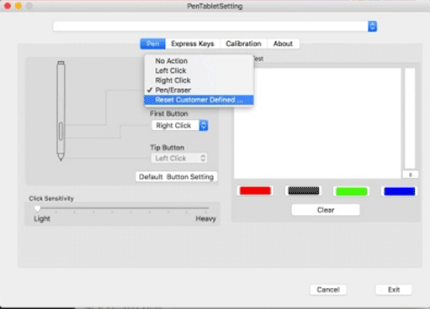 You could customize these keys to do all sorts of the shortcuts you do on your art program. For example, you could set one of the keys to switch to the selection tool(assuming you use it a lot), while having another one to activate a certain filter. The possibilities are high. While the amount of hot keys on XP-Pen Artist13.3 is low, it’s much better than none. That’s good specially giving the low price of it. Fine details mode is where the whole tablet area is restricted to a smaller area, it can be useful to draw finer details. If you’re familiar with Wacom drivers, it’s similar to the precision mode you find in there. Not having a stand is totally fine if you plan to place XP-Pen Artist13.3 on your lap or desk & draw that way. If you really care for having a stand (something I know many artists care about), you also have the option to create a stand on your own, or get a 3rd party stand instead. Let’s talk a bit about XP-Pen Artist13.3’s driver & installation. Before you get to install the driver, or even touch your unit, it’s important you remember to uninstall any graphics tablet driver you have on your computer, either from Wacom or another manufacturer, before installing the driver. The installation Driver comes in USB drive, which is a nice gesture from XP-Pen. Installing the driver may be a bit tricky, and you may have to uninstall the driver few times to get it right. In case you were never able to get the driver to work, trying another driver version may fix any of the problems you get (assuming your unit is not faulty). The thing is, you only have two versions of the driver at best, the one in the USB drive that comes with it, and the latest version you can download from XP-Pen’s site, but hopefully that’s all you will ever need. Once you installed XP-Pen Artist13.3’s driver correctly, a U sigh appears in the system tray (in the task bar). Gui-wise, the driver options are totally different than the ones from Gaomon & Huion pen displays (which have almost identical drivers). Yet, the driver provides similar options, like mapping & rotating screen area & hot keys customization (including the pen keys). The first thing you may want to do is to calibrate the pen, but before that, you need to make sure to set the scaling to 100% if you’re on a Windows 10 machines, as XP-Pen, Huion & other manufacturer always suggest. I have noticed how XP-Pen could make affordable pen displays in multiple sizes. They’re even more affordable than the other Wacom Cintiq alternatives. The lack of stand may be a bit annoying for some though. While you may not encounter or care about any of the issues I mentioned about XP-Pen Artist13.3, parallax may be the biggest deal breaker for this pen display, so keep it in mind in case you decided to get it. I really like the fact XP-Pen Artist13.3 could draw power from USB port, as that could mean the ability to use it on the go more easily than other pen displays. Usually only regular graphics tablets provide this ability, as they also only requires power from USB port.